President George Bush has signed into law a bill aimed at boosting security at US ports, saying the new mandate would make the country "more prepared, more prosperous and more secure." The bill – the Security and Accountability for Every Port Act of 2006, or SAFE Port Act – would, first, “strengthen physical security measures at American ports by utilizing 21st century inspection equipment at the port’s 22 busiest ports,” he said. The bill provides legislative authority for key elements of port security strategy, such as by codifying into law the Container Security Initiative (CSI) launched in 2002 and the Customs Trade Partnership Against Terrorism (C-TPAT), a joint effort between the public and private sectors to improve cargo security. It would also require the Homeland Security Department to establish a plan to speed the resumption of trade in the event of a terrorist attack on the ports or waterways. Pilot programs would be established at three foreign ports to test technology for “non-intrusive” cargo inspections. Currently only one foreign port, Hong Kong, scans all US-bound cargo for nuclear materials. 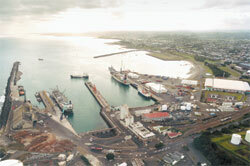 The legislation approves $400 million a year over five years for risk-based grants for training and exercises at ports. Background checks and credentials will also be required for workers at the nation's 361 ports, while preferential cargo processing is offered to importers who meet certain security requirements. Not perfect, but it's something.